When Jordan started watching the Justice League and Justice League Unlimited animated series on Netflix, I thought it was so endearing that he was watching kid shows. I’d hear some of the over the top action-y music or some of the cheesyish lines and giggle in an “isn’t he adorable” sort of way. This week I’ve been tutoring a Korean boy in English while he’s here visiting his aunt. We’ll call him “Cool Guy” since that is a phrase he likes a lot and since he is a cool guy and since I don’t want to give his real name. Mostly my job is to get him talking and teach him more English in the course of the conversation. 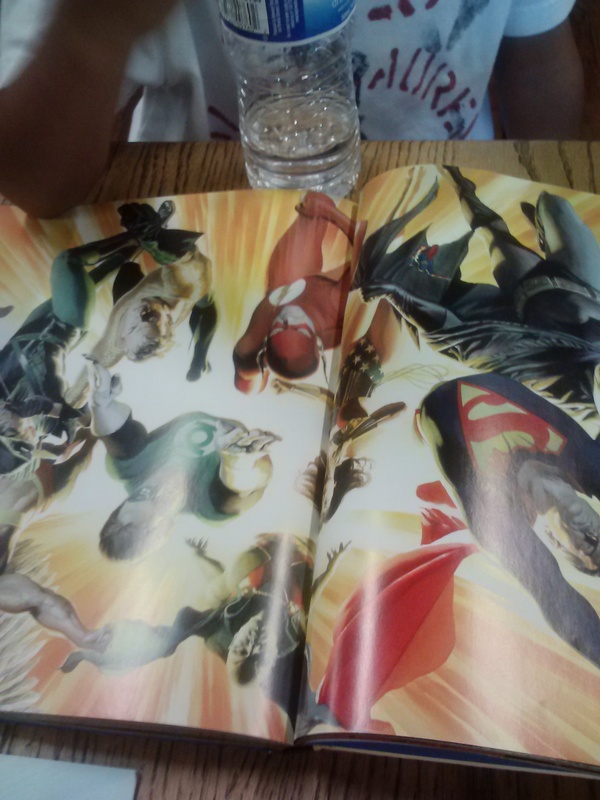 I tutored him last year and I knew he loved super heroes (What 7 year old doesn’t?) so this year that has been our focus. He has a book all about Superman through the ages. It highlights some other characters too, like the core heroes from Justice League Unlimited and I couldn’t help feeling ridiculously proud of myself for knowing so much about all of it. We talked about who they all are and what their special powers are. Then I pulled out the free copy of part 1 of the “All Star Superman” story that we got when we went to Las Vegas Comic Con. The first day it was a combination of telling the story as I showed Cool Guy the pictures and asking him questions about what he saw on the page. Today I made him show me the pictures and tell me the story all by himself. He did a really good job. Since Cool Guy’s English is basic and my Korean is limited, we had to rely on “work arounds” in our communication. Ways of describing things that aren’t always accurate but mean about the same thing. Other than the fact that Cool Guy is pretty much a tiny little genius (and hilarious to boot) what struck me was the power of a few pictures to tell a story. And even more than that, the power of a story to transcend, at least somewhat, barriers between language and culture. It was also a reminder of how our experiences surrounding a story influence how we feel about it. Sitting down and talking Superman with Cool Guy has created very specific memories that will probably keep coming to mind when I see a Superman movie or read a Superman comic. I will remember how in our “Draw and Explain” segment today Cool Guy very meticulously drew every part of Superman’s costume, even the little curl of hair at his forehead, and I will smile about it and I will like Superman a little more because of the memory.